An unaltered photocopy of your DD-214, WD AGO, NAVPERS, NG or other military issued document clearly displaying your award of the Coast Guard Commendation. The Coast Guard Commendation Medal is worn after the Joint Service Commendation Medal and before the Joint Service Achievement Medal. Additional awards are denoted by Gold Stars, and both the Combat and Operational Distinguishing Devices may be authorized. 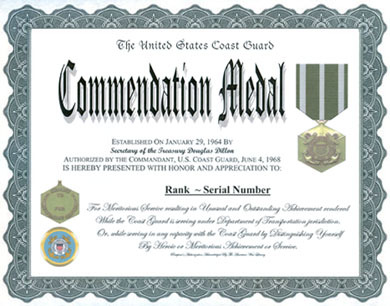 The Coast Guard Commendation Medal was designed by Jay Morris and sculpted by Lewis J. King, Jr., both of the Army's Institute of Heraldry. The first recipient of the current version of the Coast Guard Commendation Medal was YN2 Marilyn A. Seebald. She was assigned to the Permanent Uniform Board in the Coast Guard Office of Personnel and received her Commendation Medal on January 13, 1978 for her outstanding performance in the development of a Coast Guard women's uniform. The current Coast Guard Commendation Medal is a bronze hexagon, point up, one and a quarter inches wide and one and three-eighths inches wide, point-to-point. In its center is the current Coast Guard seal. The reverse contains a circle consisting of the word AWARDED at the top and OUTSTANDING SERVICE in the lower third, separated by laurel leaves. Inside the circle are the words TO and FOR, separated by a space for engraving the recipient's name. The inscription is configured to read, AWARDED TO [recipient's name] FOR OUTSTANDING SERVICE. The inscription describes the purpose of the award, and the laurel leaves represent achievement. The ribbon to the second style Coast Guard Commendation Medal is identical to the ribbon of the first style medal. 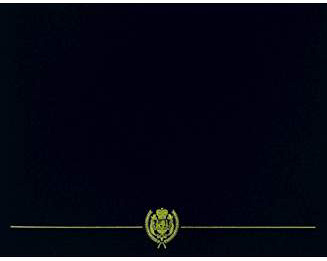 Authorized by the Secretary of the Treasury on August 26, 1947, it was originally only a ribbon bar. The first medal pendant was created July 5, 1951, and on October 2, 1959, it was re-designated the Coast Guard Commendation Medal. The current design was approved by the Commandant of the Coast Guard on June 11, 1968. Awarded to members of the U.S. Coast Guard, Coast Guard Reserve, and to other members of the United States Armed Forces serving in any capacity with the Coast Guard, who distinguish themselves by heroism, outstanding achievement or meritorious service above that normally expected and worthy of special recognition.